SANTA CLARA, Calif. Dec. 4, 2018 — Today, ONF Operators AT&T, China Unicom, Comcast, Deutsche Telekom, Google, NTT & Turk Telekom together released to ONF membership draft versions of the first ONF Reference Designs. 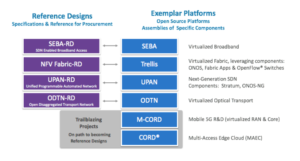 Last March, 2018, ONF operators announced their plan to build a new open supply chain and to create Reference Designs and Exemplar Platforms that will be used as the basis for procurement of next-generation network deployments based on open source. The SDN Enabled Broadband Access Reference Design (SEBA-RD) describes how to assemble a collection of open source components to build a virtualized PON network to deliver residential broadband and mobile backhaul. The NFV Fabric-RD describes an SDN-native distributed spine-leaf fabric optimized for access and edge applications making use of the OpenFlow® protocol and white box switches. The Unified, Programmable & Automated Network (UPAN-RD) reference design makes use of P4 and next-generation APIs P4Runtime, gNMI/OpenConfig, and gNOI to enable flexible data plane programmability, full lifecycle management of white box fabric and network embedded VNF acceleration. Open Disaggregated Transport Network (ODTN-RD), for open multi-vendor optical networks combining open line systems with a mix of third-party DWDM optics, for the first time bringing disaggregation and open source to optical networking. Each reference design has been authored by a set of committed operator and supply chain partners collaborating to draft the RD specification and build a related open source exemplar platform. Furthermore, the operator partners intend to make production deployments based on the RD, and the supplier group intends to help the operators build the open source base commercial platform. These teams of operators and suppliers worked hand-in-hand to draft the initial RD specifications which are now being released to membership. Exemplar Platforms are aligned with Reference Designs as an assembly of open source components to build platforms that are based on the reference designs. They are pre-integrated platforms designed to be easy to download, trial and deploy into production by operators. SEBA and Trellis are derived from the CORD platform, while UPAN and ODTN are derived from the ONOS platform. Now that the partner groups have released initial draft RDs, ONF Innovator Members have access to these draft Reference Designs. This starts the member review period, during which members are encouraged to engage, review and comment. Once the review is finalized and the Reference Designs are published, they will be made available to the public and operators are planning to base procurement on these RDs. Furthermore, once published, ONF Members will benefit from bilateral RAND-Z (Reasonable And Non-Discriminatory Zero fee) cross licensing of any intellectual property claims that might arise from use or implementation of the Reference Designs. These Reference Designs are being released and reviewed during the inaugural ONF Connect event taking place this week in Silicon Valley. This unique operator hosted event brings together network operators collaborating in the pursuit of building next-generation access and edge infrastructure and services. High level overviews of the Reference Designs will be provided to all participants, and member-only sessions will provide exclusive access to the operator groups and the Reference Design documents. This will initiate working sessions with the general membership to accelerate the review and ultimate publication of the RDs. For more information, please see Reference Design overview and additional RD details for members.